Radon services provided by The Radon Company; we can test for, and mitigate, dangerous radon gas in your home, office, or commercial real estate building. The Radon Company provides radon testing and radon reduction services in Missouri and Arkansas. 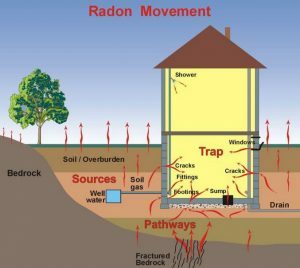 The movement of radon gas in a home. Our mission at The Radon Company is to educate you about radon, and the dangers it presents, as well as give you a path to rid your home of this harmful gas. Elevated levels of radon have been found across the United States of America. Because of the dangers it presents, many state and local regulations have been put into place to mandate the testing and mitigation of radon in both residential and commercial properties listed in the market. Because radon gas is odorless, colorless and tasteless there is really no way to know if your home, office or commercial building has the harmful radioactive gas unless you test for it. The great news is that testing is easy and inexpensive. You can do it yourself, or you can call in our team of experts for a nominal fee. Once testing is complete, you’ll know if you have levels that exceed 4pCi/L; the EPAs recommended limit. If your home is in excess of the recommended radon limits, The Radon Company can help. Most mitigation systems are fairly simple and can be installed within a day, for a cost that is equal to, or less than, most home repairs. To learn more about radon and its effects, visit our radon FAQ page, or reach out today; our experts are standing by to answer any questions you may have and talk to you about the right solution for your home, office or building. Radon services- it's what we do. Testing is easy and you do it yourself with any simple test found at your local hardware store. However, sometimes professional testing is needed to meet regulation standards. Whether you need testing or simply want to know more about what you can do to mitigate the dangers of radon in your property, just give us a call and we'll help you out. Testing is avaiable for just $75 in the greater Springfield area. At the Radon Company we are available to test for, and mitigate, risks of radon gas in your private residence. You don't need to be a realtor to contract our radon services; we are available to assist private homeowners who are seeking to protect their own family or prepare their home for listing. As a long time affiliate of the Greater Springfield Board of REALTORS®, our radon services are easy to contract because you needn't meet us at the property for inspection or mitigation services. Simply provide the CBS code and we can handle it from there. Whether its commercial or residential real estate, we've got your covered when it comes to your radon testing and mitigation needs. Reach out for an estimate today!